I am participating in a blog tour from blog tour spot for a book by Ace Collins called Sticks and Stones. This book is about the power of words (spoken and written) and how they affect us in our daily lives. I really enjoyed Ace's positive outlook. He intertwined some great stories about how people used positive thinking and words to make their lives better. I loved how he suggested we should write thank you notes to those who have impacted our lives. As I was reading this suggestion, I started to think of all my teachers, friends and colleagues who helped shape who I am today. The urge to start tracking them down and write to them is burning in me now! The power of the written word is something that is very important to me and a lot of Ace's suggestions and thoughts are very useful to me. I hope that more people pick up his book and are inspired but what he has to say. Ace Collins is a prolific author, publishing over sixty non-fiction books and has now opened the door to language barriers both positive and negative. Collins is slated to release Sticks and Stones (Zondervan, March 2009) on the heels of his first novel, Farraday Road. With earthy wisdom, simple action points and his trademark gift for storytelling, bestselling author Ace Collins shows how—and why—to make the words used each day count. From a friendly hello, to a handwritten thank-you note, to a thoughtful phone call, words can have a positive impact in a negative world. Of the roughly thirty-thousand words spoken by most people every day, Collins challenges readers to imagine if just a handful of them could save a life or heal a broken heart or inspire a vision that would shape the course of history. He urges that today is an opportunity to speak—or write—words of incalculable potential for good. 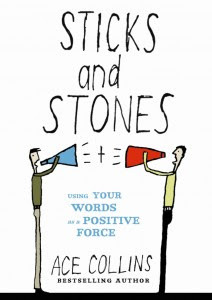 With simple action points and colorful stories, this inspiring book will help weed out sticks-and-stones negativism and unleash the surpassing, life-giving, destiny-shaping power of positive words. What does it take for words to make a difference? Perhaps a simple thank-you letter or an encouraging email, a simple hello, a thoughtful phone call, a note written on the back of a family photograph — the possibilities are endless. Sticks and Stones shows the power and importance of words and how to use the right words to have a positive impact beyond anything you can imagine. Ace Collins is the writer of more than sixty books, including several bestsellers: Stories behind the Best-Loved Songs of Christmas, Stories behind the Great Traditions of Christmas, The Cathedrals and Lassie: A Dog’s Life. Based in Texas, he continues to publish several new titles each year. He has appeared on scores of television shows, including CBS This Morning, NBC Nightly News, Good Morning America and Entertainment Tonight, along with appearances on CNN and MSNBC. Visit http://acecollins.com.